Athens: The Greek government teetered on the brink of collapse on Thursday over plans for a referendum on a euro zone bailout, with ruling party defections casting grave doubt on whether Prime Minister George Papandreou can survive a confidence vote. “I don’t think the government will last until tonight," said Costas Panagopoulos, managing director of pollsters ALCO. “The referendum is dead," ruling party lawmaker Nikos Salayannis said on state radio. Another lawmaker of Prime Minister Papandreou’s socialist party PASOK said she would not support the government in a parliamentary vote of confidence on Friday, cutting its majority for the vote to just one. Snap elections would probably follow if Papandreou’s majority vanished. PASOK was in turmoil on Thursday, with one senior lawmaker calling for a government of national unity following Papandreou’s shock call for the referendum, and another saying he should resign. Venizelos, one of the most powerful men in the PASOK government, originally supported Papandreou’s plan. His change of mind came after he and Papandreou attended an emergency summit in Cannes on Wednesday with German Chancellor Angela Merkel and French President Nicolas Sarkozy. A finance ministry source told Reuters on condition of anonymity that Venizelos believed the vote on the bailout, agreed by euro zone leaders only last week, should not be held while immediate funding to keep Greece afloat still had to be secured. “Under these conditions a referendum is exactly what the country does not need. He would not have objections if all our pending issues such as the loan instalment and the completion of the bailout plan had been sorted out," the source said after the meeting with Merkel and Sarkozy. “It was a very difficult meeting," the source added. Papandreou’s bombshell announcement on Monday of the referendum and parliamentary vote of confidence plunged Greece into a political as well as an economic crisis. Papandreou’s once-comfortable majority has dwindled to almost nothing. On Thursday PASOK lawmaker Eva Kaili announced she would stay in the party but refused to support the government in the crucial vote expected late on Friday. “Herewith I inform you that I am not resigning as an elected representative of my fellow citizens and my generation, but in Friday’s vote I will not cast a vote of confidence in your government," she said in a letter to the speaker of parliament, a fellow PASOK member. Kaili published the letter on her Facebook page. 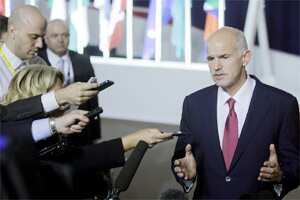 This left Papandreou with the support of just 151 deputies out of 300 for Friday’s vote. PASOK lawmaker Costas Gitonas also said the referendum should not take place. “No, by no means," he told Mega TV. “It’s a madhouse."